I mentioned in an earlier post that John Smith was kidnapped by a press gang of the British navy when he was nine years old and forced to serve on a ship until he escaped at age 14. 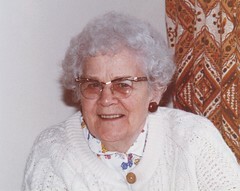 He made his way from Halifax to Ontario where he met and married Ruth Dobson. John and Ruth settled on a farm in Grey County and raised a family. One day I was able to contact one of our elderly relatives, Evelyn (Smith) Barham who gave me most of the following family tree information. – The oldest child was Mary, was born in 1856. She married my great-grandfather Sam Vance on April 10, 1878. Sam was killed in Oct 1899 in a hunting accident. Mary died in 1924. – The next child was William, who had 4 children. One of his sons became a policeman in Toronto; one (Allen?) went to Edmonton; one of his daughters was named Cora. William himself found a home with his youngest brother Moses for the last few years of his life. – Then came Amos, born in 1860. He married Elizabeth (Lizzie) Searles. They had five or six children, but only two, Francis and Edna, lived to adulthood. Francis married but his wife died young and he remained single until his older years, so he had no descendants. – Martha married John Allen and they had six children. 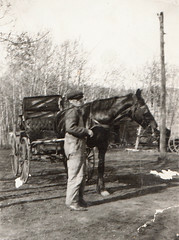 They homesteaded not far from Moses, but gave that up and moved to Evesham, SK, near the Alberta border west of Unity. Apparently even in those days some marriages ended in divorce. When Martha found her husband impossible to live with she divorced him and moved to Michigan where one of her children lived. – Barbara died of a ruptured appendix when she was about fourteen. – Tomlinson married an old Scot named James Ronald. James and his wife came to this country and farmed near Listowell. In their older years they ran a home for orphans in Listowell and great-aunt Tomlinson went to work for them as a housekeeper. Then after Mrs. Ronald died Tomlinson married him. I’ve verified this info in the census records. 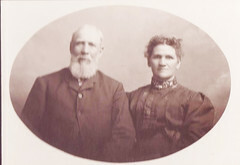 After James died his children wanted that house, so Tomlinson brought several of the orphans with her to Spy Hill to visit her brother Moses, then went to Saskatoon with them. She had no children of her own. – Moses married Margaret Barnett & they homesteaded at Spy Hill. They had four children, I believe, and both died in 1927, she of a heart condition and he of TB. Though according to Evelyn, her father was in a train accident around 1910 that gave him lifelong injuries. At the time of marriage, our great-grandfather Sam Vance was living in Blanchard Twp, Perth County. And here Bob & I lived in that same township for ten years and never dreamed such a thing!! He was 25 and employed as a mason, easily imaginable in the St Marys area. Great-grandma Mary Smith was living in Zorra Twp at the time of marriage, Zorra being south of Blanchard. She was 22. They both listed their religion as Presbyterian. Their witnesses, Peter Coats and (Mary’s sister) Martha Smith, were Molesworth residents. Ruth Smith died Sept 22, 1891 at the age of 66. She was being cared for at the end of her life by Mary. Cause of death was listed as infection of the lungs, but it seems she had a terminal illness for some years before, referred to only as a “women’s complaint.” (Cervical or uterine cancer?) From the following census record it appears John lived with Amos & Lizzie after Ruth died. Amos Smith Age 30 Born Aug 20, 1860 English origin Religion ?? 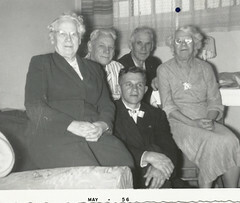 In the Spy Hill area history book there’s a picture of Mary and her sisters Martha and Tomlinson, taken when Mary was over 80. This entry was posted in Smith Family and tagged conscription, Dobson Family, family tree, genealogy, history, Ontario, press gangs. Bookmark the permalink. My mother was one of the orphans that Thomison took with her! Do you know if there was any information/records that were kept regarding the children that were there? I’m so glad you got in touch with us! I live near Saskatoon and have often wondered if those children stayed here and if their descendants might still be living in this area. My impression was that Aunt T brought two girls to Saskatoon, but I can’t say anything about their records from Ontario. Was there any kind of Social Services back then? I have the census records that list James, Tomlinson and James’ son Levi (still living at home). Undoubtedly the orphans were there, too, but not listed. I’ll double-check this, though.